Kingfisher Bio 3 Concrete & Stone Cleaner uses the very latest in non-ionic technology. Our concrete stone cleaner produces a unique carbon cleaner capable of meeting to the needs of professional contractors and painters. It removes dirt, smoke char, general exterior grime and soot from both internal and external surfaces. Its unique formula, dissolves dirt deeply encrusted in old coatings just by scrubbing the offending areas. 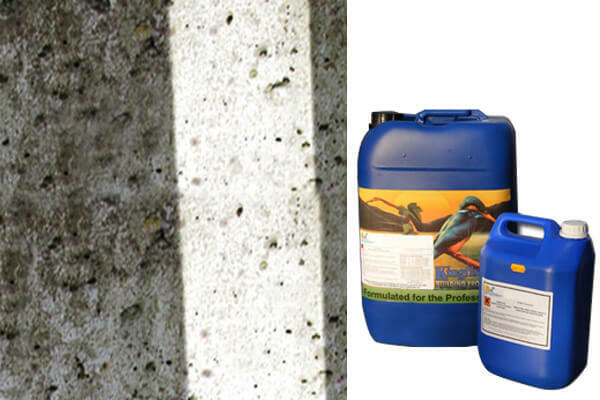 Kingfisher Bio 3 Concrete & Stone Cleaner offers great value. It can be diluted up to 20 times depending upon the type of dirt being cleaned. As a professional moss killer, our concrete stone cleaner is suitable for most types of concrete and stone. Not only is this product easy to use, but it also ensures there is no need for aggressive pressure washing. Simply dilute with hot water and see how this unique formula can help you clean your concrete surface. This product is one of the quickest and most effective methods of cleaning away impurities from concrete and stone surfaces. It will ensure that your chosen surface restores its natural texture and colour. So, if you are looking for a concrete stone cleaner that is second to none for removing dirt, look no further than our Bio 3 Concrete and Stone Cleaner.